Day 1: March 1 Eager students were excited about their first Interact Conference. After loading the vehicles and packing down my suburban with enough clothes to last a week, we were off to Pigeon Forge. The first order of business was lunch. We stopped at “Steak and Shake” for greasy burgers and thick shakes. We arrived at the conference and registration went smoothly. After room keys were given out, we charged our phones and set out to attend the Hatfield and McCoy’s Dinner show. We sat on the McCoy’s side as we enjoyed fried chicken, pulled pork, mashed potatoes and corn. The chocolate pudding was almost as good as the Hatfield and McCoy stage that doubles as a swimming pool. We saw high flying hillbillies, tap dancing cousins, sharp shooting ladies and yes, a love story that ended with a wedding. The Interact Conference talent show was up next, but we were not registered. However, with performing arts blood flowing through their veins, a couple of our kids took it upon themselves to find Bruce Wilson and convinced him to put a couple of our acts on the agenda as an “exhibition”. De’onte Bishop brought the house down with his solo, receiving a standing ovation. Kariah Cook and Maria Holt had the whole conference standing and dancing with them as they performed their hip-hop routine. Both of these acts earned a special invitation to register next year as they were undoubtedly stars in their talent. Curfew check came at midnight and besides an UNO game that got a little loud, all was well. Roll call was colorful and there was an update given on district products and donations were given by clubs. Clubs were also given the opportunity to showcase their group t-shirts with expressions of inspiration. We had an opportunity to meet the many exchange students, some whom shared their experiences. We were then released for some free time, but we took this opportunity to meet and prepare for our panel discussion with our CAC Leadership guests this coming Tuesday. The students did a great job in our first rehearsal and suggested we go go-cart riding. After receiving verbal permission from all the parents, we went across the street and the kids enjoyed go-cart riding with hair flying in the wind and a few minor fender benders. We came back to the hotel with just enough time to clean up for our banquet dinner and the “Opry”. During the dinner, the District Governor Elect, Mr. Greg Maciolek, spoke on the importance of choices, friends, and work ethic. He challenged our kids to learn the names of custodians and treat them the same way they treat their principals. He also spoke of the importance of trades and promoted careers that are not necessarily on the traditional collegiate pathway because 67% of today’s students will not work in a career that is a representation of their college major. That night was still young when we headed to the Opry. None of us knew what to expect, but we were definitely in store for an entertaining treat! This production of dancing, singing, flying acrobats, comedic juggling and crowd participation was fit for Las Vegas! Our kids were dancing in their seats as the Opry dedicated their show to music that spanned four generations and different genres of music. During the meet and greet portion following the show, the kids were able to meet and get advice from the entertainers in the production. We arrived back at the hotel in time to play a few games of UNO and turn in for curfew. Day 3: March 3 During the Conference wrap-up we were inspired by the motivational speaker, Katie Sneed-Sanchez, as she gave tangible experiences of the Four-Way Test. Then the highlight of the trip came during the final award ceremony. 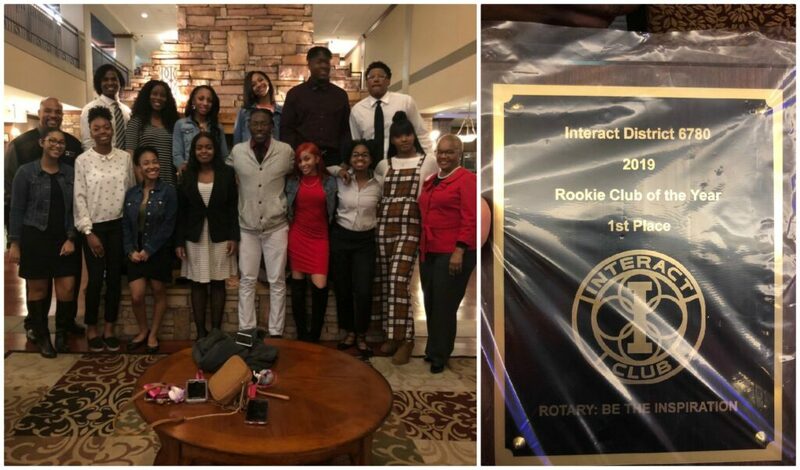 Our Interact group received Rookie Club of The Year! Kariah Cook, our club president, accepted the award on our behalf. Thank you, Rotarians, for providing exposures and opportunities that might otherwise not have been experienced for our Austin-East Interact students.